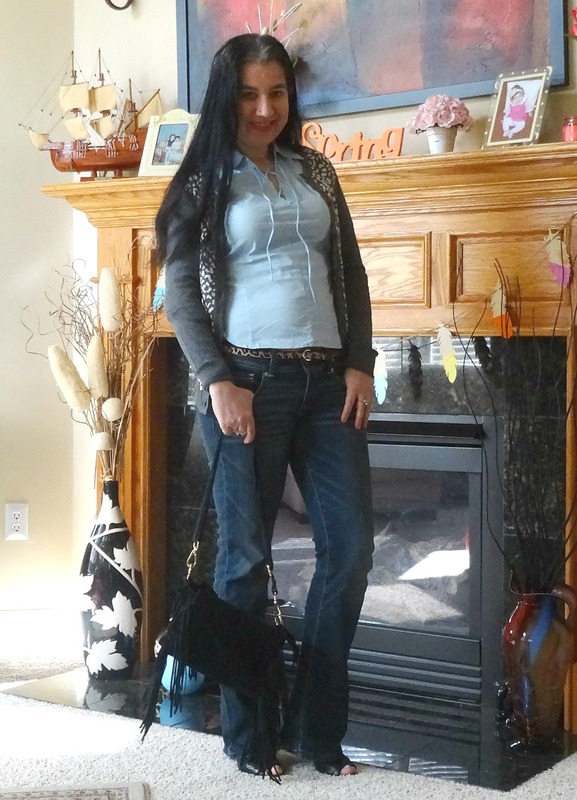 Jeans + Sweater with a Fringe Bag. This outfit feels so me. 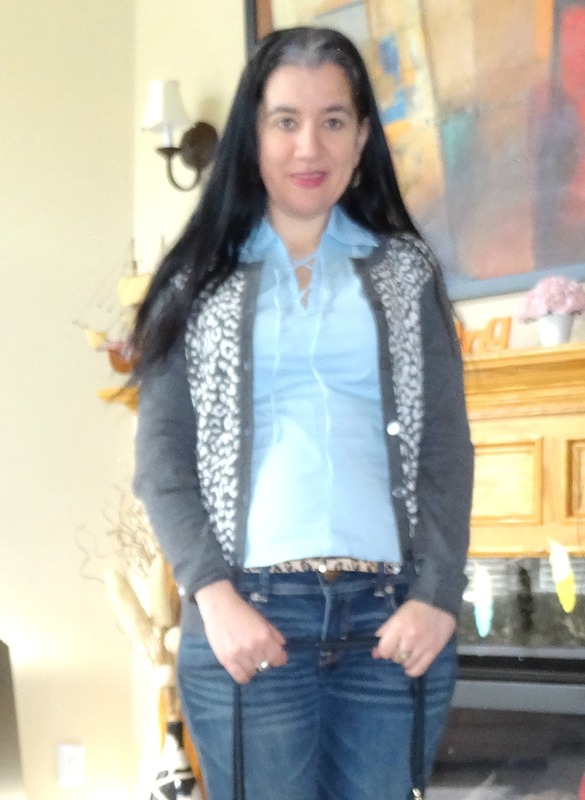 Since I was in high school, in my early years of colleges, early twenties as a single girl, as a married woman and now as a mom, I have worn a version of this 'uniform' - jeans and a sweater or leggings and a sweater, usually layered with a third piece like a blouse, scarf, vest, jacket or statement necklace. 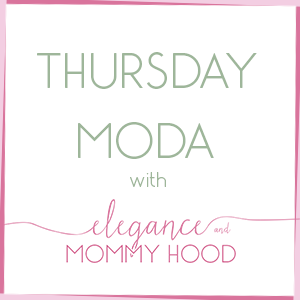 Whether it is a regular sweater or a cardigan like today. That is exactly what I did here. I wore this outfit a week and a half ago to go shopping at the mall with my loving mom. 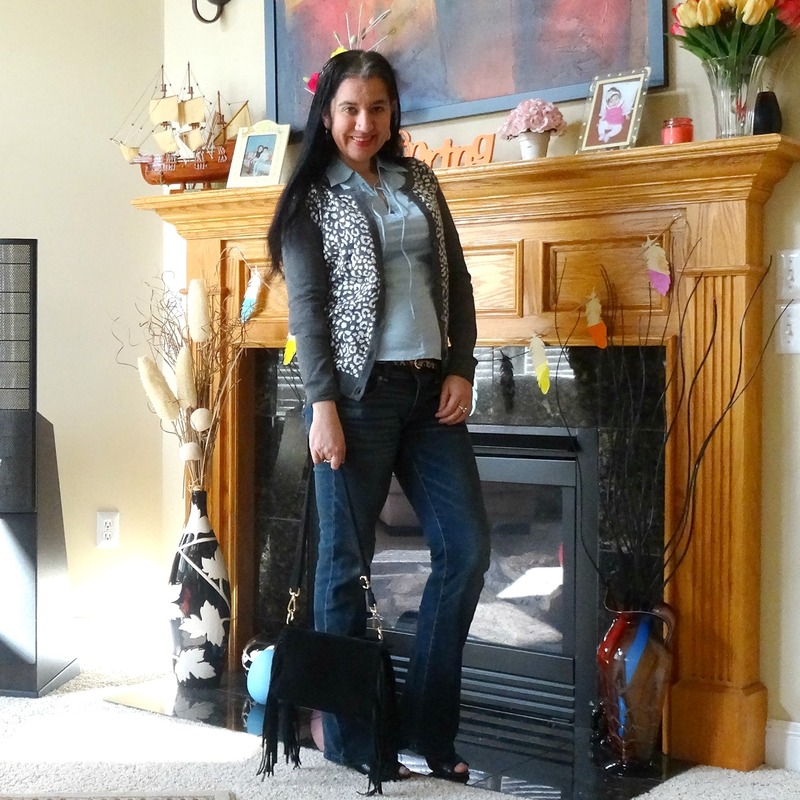 Some pieces are new, like the bag, belt, cardigan and booties but the jeans and blouse are both old. They are both very on trend still: flared denim and lace-up neckline blouse which happens to be in an on-trend color - Serenity. And I finally purchased a Fringe Bag. I like not to pay full price for trendy items especially at Target but mine is so nice, in a soft real suede and the fringe off the sides is long and pretty. I didn't mind paying around 37 bucks for it. The bag makes a statement to this otherwise simple outfit. But you know, Jeans + Sweater it may be, but this outfit is very put together. This outfit is me and what I wear about 20% of the time and I don't mind it one bit. Do you have a jeans and sweater uniform of your own? Light Baby Blue/Serenity Popover, Laceup, Poplin Shirt: Express (similar, short-sleeve option in off-white, small Splurge), (gorgeous floral option, Great Deal, love this). 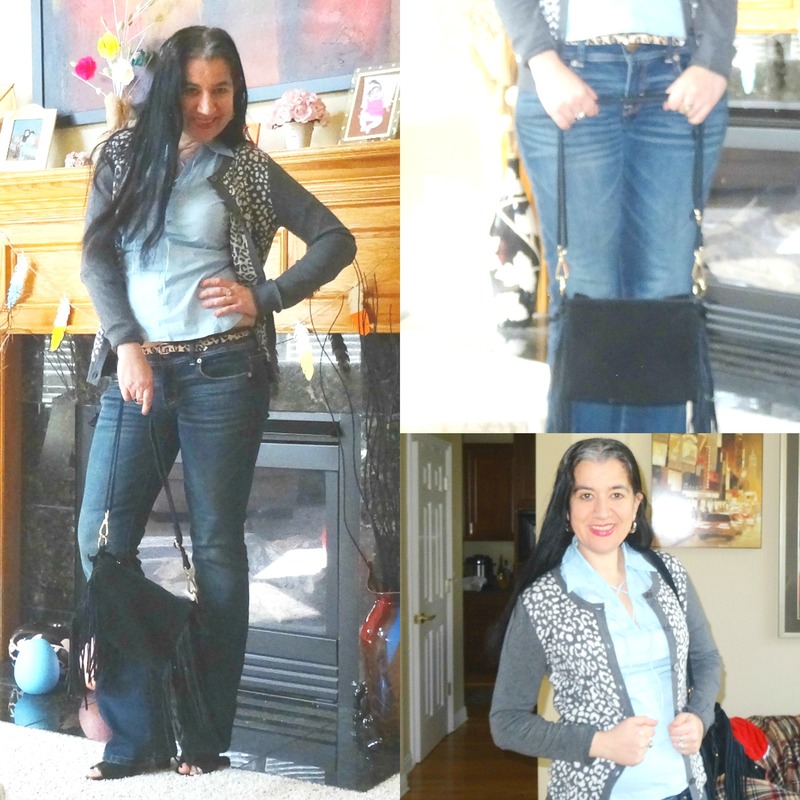 Gray Snow Leopard, Long-Sleeve Cardigan: Merona via Target (New) (very similar, Steal), (similar, Great Deal), (similar, Splurge). 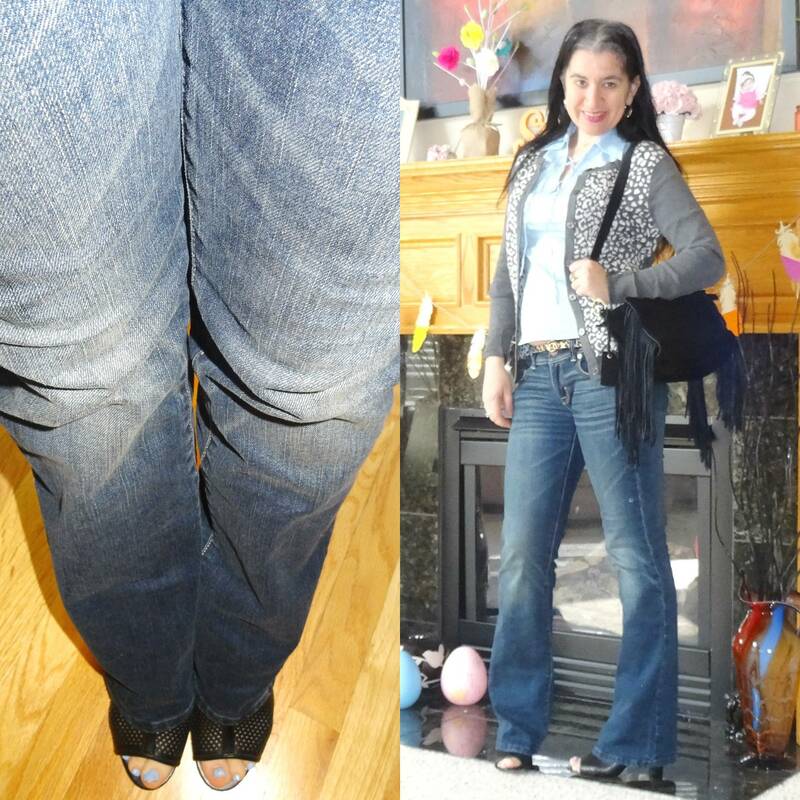 Medium-to-Dark Wash Blue Flare Jeans: American Eagle (very similar current option by AE, Steal), (similar, Great Deal), (similar, on Sale, love these), (trouser option, Great Deal, love these). Leopard Calf Hair Skinny Belt: Old Navy (New) (similar, Splurge, love this), (similar, Great Deal), (similar, Steal). Silver, Ear-Shaped Hoop Earrings: White House Black Market (similar, Splurge, love these), (gorgeous fun option, Great Deal, love these), (similar, Steal). 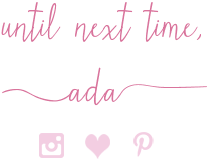 Jalynn, Katherine, Lauren, Leeanne, Linda, Lindsey, Lisa, Liz, Madeline, Monica, Nicole, Rebecca, Sarah, Mix+Match Fashion, Stephanie with Jessica, Michelle + Whitney, Tara, Vicki, Victoria and The Blended Blog.